If we think Predeal we think ski. Hotel Mythos Luxury Rooms in Predeal is trying to change this perception, demonstrating that summer can be as beautiful as winter in the mountains, completing it with impeccable services and a breathtaking panorama. These facts being considered, we felt that the hotel website should be up to the same standards. 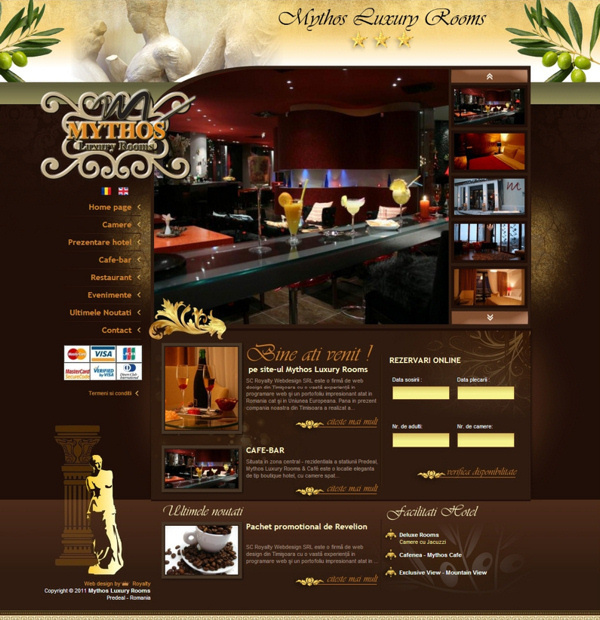 Thus we believe was born an elegant website with Greek notes. The colors chosen are mostly earth colors, brown, cream, leaving the hotel to capture all the attention. For this reason, each page of the website benefits a photo gallery that is not in the bottom of the page but in its header. Page content can be totaly edited by the user. A very important element of this project is the online booking module. Within it, with a minimum of information you can check availability of certain rooms and its price. Also you can add additional services, extra beds, romantic dinners.